Imagine you're sitting at home, your significant other is out and suddenly you receive a text message on your mobile phone. You read, “I am breaking up with you, I don’t love you anymore”. You then reply, “What…..what did I do to deserve this” . Hours later both are still texting on the cell phone with short cryptic angry, hurt messages with all thumbs. This has become a common ineffective avenue of fighting. These are unskillful methods of conflict resolution! Does this sound like science fiction? In our private practice in Indianapolis, text messaging has become the norm for communication with traditional and non-traditional couples. It is happening with all ages from age 15 to age 55. Why are couples not talking directly to each other?! What happened to old fashioned verbal face to face discussions? Text messaging is a very effective mechanism to send short few word messages like, “I am running late”,” pick up the kids at 5pm” “give me a call when your done”,etc... How did we go from practical short communication of easy to respond to questions and comments to expecting to have emotional intimacy via text messaging? In our experience, text messaging stalking/warring is becoming widespread. One person is angry/hurt with the other, and texting is used to stonewall and/or attack the significant other. A barrage of “ why are you ignoring me”, verbal attacks, or worse still, “ are you with him/her, you expletive deletion #!!#!#!#”. Then the re-dial button with the text copied is hit, 50 times per hour and this starts the cyber stalking process. This sometimes escalates to physical violence when both parties meet. 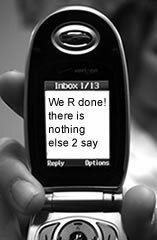 As a psychotherapist I ask clients to stop fighting with text messaging. What I am told is that they “cannot stop”. Simple questions without intonations can sound like an innocent question/comments, however there is no insurance that the other will interpret the message as it was intended. It could sound like a demand or accusation to check up on a person like “WHAT ARE YOU DOING”, which could be interpreted as yelling. If the two people are not getting along, that simple question could be interpreted in many different ways and too often it is the worse case scenario that rules the mind. Assumptions and misinterpretations are common place without the benefit of verbal and nonverbal cues, in the absence of both of those the only data comes from cryptic text. 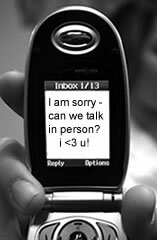 Text message is the worse way for couples to communicate emotional intimacy or to problem solve. E-mail is bad enough but at least you can be verbose. Text messaging is short and laborious, and often an impulsive expressions on a little phone screen where much of the message is left to the imagination and interpretation and the reaction is based on the FANTACY of what is meant. Clients say to me, “it is much harder to talk face to face, we argue too much”. Lets examine that response. When two parties argue face to face, they see each other’s body language, intonations and can better know how their words are affecting the other. The couple can ask each other for clarification in real human time in front of each other. The tone of the words and remarks are more clearly communicated, thus preventing the imagination of the other to determine the tone in text messaging. Each person takes personal responsibility for what they say because they are saying it in actual real time with their words, body language and voices. There is less left to the imagination, hence less misunderstanding and misinterpretation which often escalates conflict and fallout. I have a guess to why text messaging is so popular in these times. For many couples texting is used as a means of courting and is felt to be romantic, interpreted as a means of flirting, showing interest, and signaling to each other that they are being thought of, touching base. The problem is that when people use text messaging to communicate emotional intimacy and/or to avoid emotional intimacy, the consequence too often results in unresolved hurt feelings and anger. Text messaging is too often used to avoid the face to face communication of difficult topics. I ask my clients not to text unless it is purely logistics, like, “I’m not able to pick up the kids on time, can you? or running 10 minutes late” . I encourage them not to communicate their pain, or try to resolve problems via text messaging. I also indicate that if an innocent communication begins to become conflictual via texting, that they table that dialogue until they can sit together and discuss or have a telephone conversation. Some people are emotionally addicted to text messaging and I ask them to ban text messaging completely unless it is used for work. This is difficult for many clients because they feel at a loss without the constant contact with the other person and actually feel emotional pain of withdrawal and feel rejected. I ask them to talk about their feelings with the other person face to face, and if that is too difficult they can both come in and talk with me in the office. If you find yourself dependent on emotional text messaging, make an effort to stop. This medium does not work effectively and can be guaranteed to cause you emotional distance with your partner. If you cannot stop texting, get professional help, you probably have difficulty in expressing yourself with the other person and this points to emotional intimacy difficulties. You and your partner have a better chance at achieving a meaningful conversation if you make a phone call or wait to see each other in person. If you continue to have problems, you may want to contact a professional relationship counselor/psychotherapist for help in improving the communication with your partner. Remember direct one to one contact with your loved one is what attracted you in the first place. Don’t sell your relationship short by text message wars.